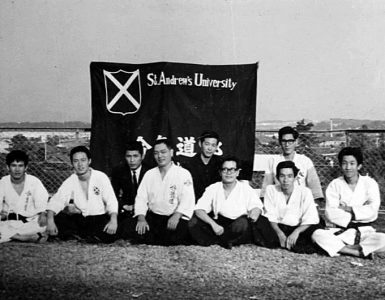 Thirty years ago, practicing Iwama style Aikido was very physical and often harsh. Perhaps then this relatively young martial art was in the midst of evolution having been transplanted to the United States from Japan. I was a young woman engaging in what seemed a stressful frenzy at the time. The strictness and discipline was not unfamiliar to me, my severe piano lessons and expected academic successes had prepared me. Back then Aikido was no different. The practice was very martial, exact and intense. There was little talking. Men twice my size disregarded my smaller wrists and applied nikyo so quickly and fully that pain would shoot up to my shoulder. I was slammed into the mat by well-meaning partners, unconsciously using muscle to flatten me. I quickly learned the art of good ukemi, which helped me survive physically. At 5 feet and 100 pounds, I had neither the height nor girth to physically match my fellow students, or withstand the constant impact of an incorrect highfall. Additionally, creating movement from a static position, so that a blend was even possible, was extremely difficult and frustrating. Interestingly enough, I heard echoes of the same complaints from other women aikidoists in many a dressing room in those long ago days. The exchanges were always the same. We comforted and supported each other. The discouragement that shapes our technique as well as our character still resounds today. The intensity of the practice and physical endurance of pain caused me to quit for awhile until I discovered the kind guidance of my Sensei for 20+ years, Hans Goto, 7th Dan, at Bay Marin Aikido in San Rafael, California. His approach had much more physical regard concerning safety, and so I resumed training and became very serious. I did, however, continue to hear the laments from the visibly physically unsubstantial, the weaker, the shorter, the smaller, the frailer, mostly women. For myself, the path was arduous and unyielding but at some point my perception became more scientific, challenging and intriguing. Amazingly, I have prevailed even to this point and beyond (I expect) since I am still learning while teaching. It was in the space of separating from Bay Marin and creating a new place to carry on the Iwama teachings that I suddenly felt the overwhelming feeling of responsibility to carry on the lineage in my own dojo at Cotati Aikido. 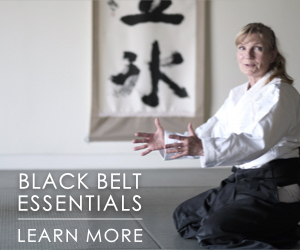 It was at this remarkable period a newer aikidoka, Susan Harrow, media consultant, author and all around champion of enthusiasm, approached me about doing a few videos to give advice to “women….and a few men”. I concluded that perhaps she had heard those echoes as I had from shorter and smaller people trying in vain to be a good contender. In truth, I now believe, she had probably heard “other” echoes from other places, but of similar content. At first, I balked silently because quite honestly, I am no orator. Through Aikido, in fact, I had become a better listener, to my Sensei, ukes, and to those I had interaction with off the mat. Somehow, however, the persistent feeling of responsibility convinced me I could help newer Aikido students or smaller students, or actually any student who was willing to listen! The idea quelled some of those overwhelming feelings of self-consciousness, I took the attitude that instead of it being about me, I was doing a service. The amazing Harrow engineer was skilled and patient. Like the practice of Aikido, it was an evolution. At first, talking in front of the camera didn’t seem natural. We practiced until the model of what you now see on Facebook: “Aikido Advice for Women and a Few Men” took shape. 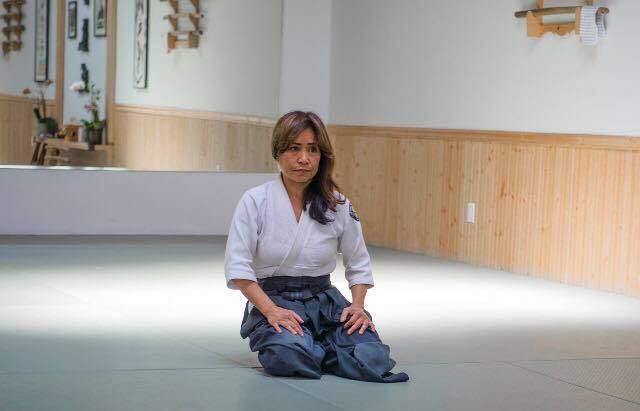 Our original intention was to address some of the issues women may face on the mat and at work, and how aikido practice can translate learning in both places. 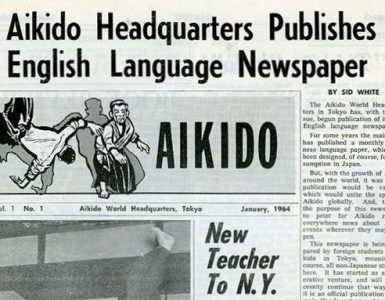 The present FB forum created by Susan hopes to hear others speak of the physical, mental, emotional and spiritual aspects of Aikido into daily life. It is a place to share the challenges a discipline or practice teaches us given our own perceived limitations and life experiences. It is directed to inspire joy in our practice/life and infuse kindness and compassion and ultimately universal harmony. Quite a goal, despite our human tendencies. The inspiring/inspiriting discussion with accompanying images that are provocative, beautiful, wild and entertaining keep in step with the showmanship of O’Sensei and Saito Sensei. The idea maintains the mystery and magic and resonance of Aikido not easily explained lest one seriously train the body, mind and spirit. In an attempt to include others not training specifically in Aikido we decided to embrace the entire spectrum of lifework and nature as a whole. As a result, many of the people who visit the Facebook group don’t even practice a martial art. 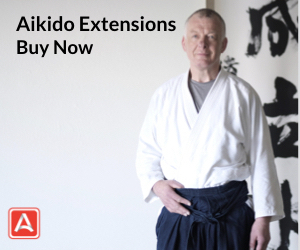 Aikido is the martial art of Peace that speaks to serious aikidoists while still being inclusive to people who do not train in this particular path. In truth, the paths are many, but the discovery of self-potential and imminent growth in wellness is the same. Our goal is to stay as close to the lineage of teachings of O’Sensei as translated from Saito Sensei to Hans Goto Sensei. The videos are created to give the clear, distinct, exact form that is the Iwama hallmark of precise basic technique. Pure and true form. Application is only rarely emphasized as it may provide too much of a distraction – just as too much atemi was not the intent of the founder. Basic tate waza (ikkyo through yonkyo), swari-waza, weapons suburi, and riai (sword/jo/body relationship) are expressed as well as study in dealing with more than one attacker. 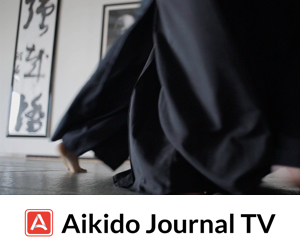 The physics of Aikido is monumental for effortless movement, as is correct distancing, connection, weight distribution and predicting movement in advance. Mindset and Ideas to advance learning while not focusing on results are explored. Consciousness, mindfulness and awareness and other unseen, unmeasured phenonmenon make learning contextually rich. I invite you to visit our approach and share your insights on our Facebook page, or contact us by email. I felt the same way about martial arts since I was 15, when I started. Also: many male partners, teachers and simply men who are either involved in martial arts or comment on martial arts practice, imply that women do not belong in martial arts, which I think is wrong. Women do belong in martial arts….. That’s just Western male chauvinism poking it’s ugly head up!! Women samurai were well known for taking up the yolk!! 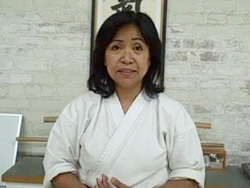 My wife Catherine practised hard Tomiki/Shodokan aikido for 15 years and achieved Sandan. Was was well respected within the B.A.A. She suffered injuries as much as the men, recovered and got on with it as we all do…..
Nobody wants injuries, but no matter how responsible one is, they are inevitable at some stage, even just by bad luck alone. She only retired from regular aikido to bring up our children, but came back now and again to show the younger ones how it is done, much to their amazement!! I applaud what you are doing. 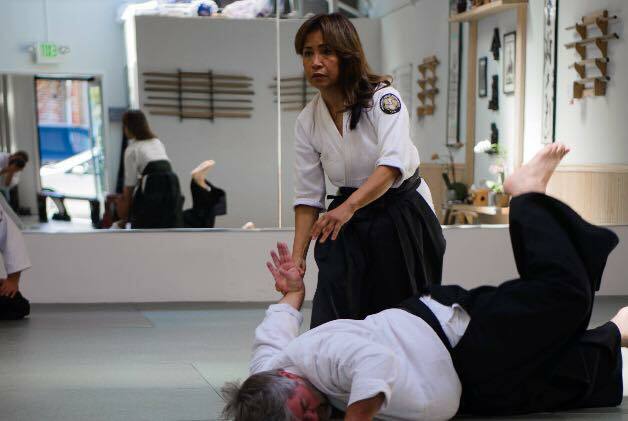 Having trained for 20 years in three different Aikido styles, including 10 years in Iwama style, I am convinced that unless you are the biggest, strongest, fastest person in the world, you had better learn the physics of Aikido. Hans is a wonderful person and teacher. it wasn’t all that easy for us guys, either, btw. i recall that in my second year spent a week at a hot spring and every day soaked out a different level of pain. then went back to the dojo and put it all back in again. i think that the severity led to the development of a pretty good progression for teaching ukemi. i like to remember that Saito sensei emphasized static basics but he also said to make things hard, but not impossible. Women and kids actually have advantage on learning Aikido for their physical softness and suppleness. To be hard and tense are easy, but to be relaxed and soft are difficult. The Chinese martial art style- “Wing Chun,” was invented by a woman (a nun ), around 300 years ago. As most people know, “Wing Chun ” is a very powerful and practical martial art. Therefore, in the martial arts world, you could do it, not only to survive, but to excel. A true and good martial artist(he or she) is someone who uses martial arts to stop aggression and violence, and to promote social justice. Water is soft, but also very powerful and strong. Humility and gentleness is a strength, not a weakness. Both Aikido and Wing Chun are very good and practical and powerful martial arts indeed. Why do some people assume that “hard” practice means stiff and unyielding…. I have practised wing chun and know that the power comes from the whole and from the core area of the body…. I incorporate it into my aiki practice. For me they are compatible as newaza is from Judo…. Same for me Tony…but have not done Wing Chun…I understand it’s Great with Aikido? I’ve had the great pleasure to be a student of Hans Goto-sensei along with Ginny for about 20 years. It has always been emphasized to us that Saito Morihiro’s teaching in Iwama was a complete system involving Katai (well defined definitive technique), yawarakai(still well defined but introducing movement), nagare (technique involving movement, flowing in nature) and ki no nagare. These are also known as diamond, willow, water and air or space. To be seduced by just one of these, rather than a dedicated study of the entire system can give an incomplete view of the nature of Aikido. Keep studying, keep learning, never assume your knowledge is complete. What I’ve seen of Wing Chun is amazing and quite complementary to Aikido. However being the slow learner that I am I will need to dedicate the next two life times to Aikido before I branch off to study complementary forms. I completely agree with all the principles you outlined. You see there are more similarities than differences in many things. It takes evolution in the art to go from the self to including your uke and to seeing that your uke is what it is all about, not necessary yourself. Ego must be let go of and yes, harmony is not just with the other person but with the natural sway of things, our environment especially. Nothing should conflict. We seek oneness. an open mind sees and learns many things. Until we can learn to see our ukes as ourselves then our techniques will just stay as form and not transcend. I find Wing Chun fascinating because, like aikido, center line is seems to be so clearly defined (but hard to see). and it is a bodily art, not just arms and hands flinging. I really appreciate your input. In aikido many forget we are not doing something ‘to’ someone, but really with someone as if they are an extension of ourselves. And thereby appears compassion. These arts endow us with cherished human relationships and joy and liberation in training. May you be well and train in a joyous manner always. 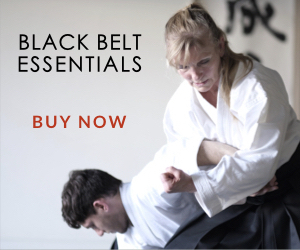 All martial arts can be good with aikido…. All have the same core instincts, so that means all martial art are compatible with eachother…… there is nothing absolute except limitation…. Steve, this point is very well said: In Aikido if person A is only conerned about his/her own benefits, person A will never gain the “ai” because “ai”(harmony) is a relationship with another person, with the environment, and with nature. I had been training in Aikido for 10+ years regularly before taking up Wing Chun. I can definitely say as will my training partners that it improved my Aikido greatly. The sensitivity and understanding of body mechanics gained from hours of Chi Sau sticking hands will improve any martial artists skill level. Even if you ignore their hand motions and just do the footwork I am sure your Aikido will reach higher levels. Just like in Aikido there are different styles of Wing Chun and as with all martial arts you have to pick the style that fits with you physically and mentally. I have met some Aikidoka who began Karate and described similar improvements in their Aikido. I am continually amazed at this journey on the aikido path.